The joyful singing of Christmas carollers rang through the lobby of Dorsett Hotel KL and reverberated all the way up to the first floor to Checkers Café. It was 7pm and the occasion was the lighting of the Christmas tree. Earlier, guests and media members sipped cocktails and nibbled canapes at the Windows Lounge where the Christmas Market was in full swing. Clothing, copper ware, artisan jewellery and other craft attracted shoppers. One stall caught my eye. Nicole Lim (www.facebook.com/NicListOfMustHave) offers Flower Power Raw Honey, Virgin Coconut Oil and tangle-free combs/brushes among other health products. The Christmas Market will be on till December 21 from 11am to 8pm, so do hurry if you want to pick that special gift for your family and friends. At Checkers Café, dessert is what you see when you step in. 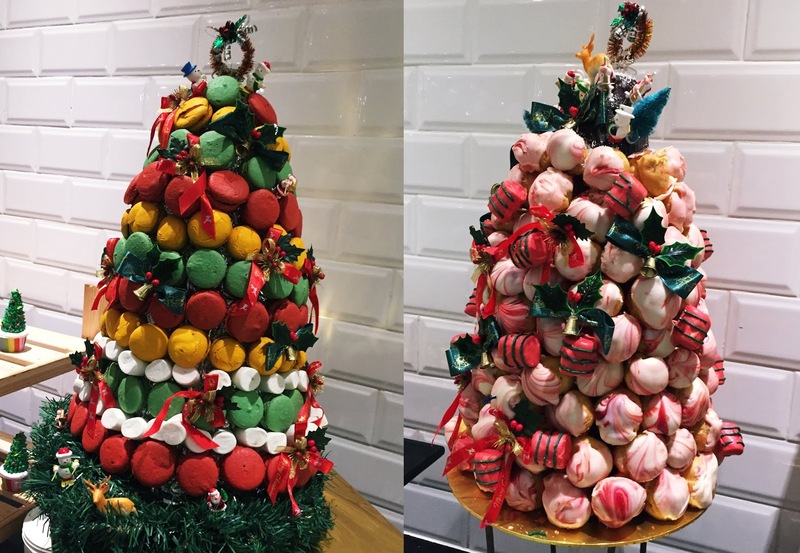 A reminder, perhaps, to save a bit of tummy space for the array of sweet treats that include a macaron Xmas tree and a profiteroles Xmas tree, standing proudly amongst little cupcake trees, Gingerbread houses, log cakes, fruit cake, fruit tarts and charcoal cones filled with custard and fruit. The island table is groaning under the weight of tiers of cold cuts, cheese (including deepfried mozzarella fingers) and roulades. There’s mousse, ham, chicken and two types of smoked salmon, while right behind it are mussels on ice and crisp salad greens. I headed for the trays of hot food, with two types of soup: Minestrone and a creamy Chestnut. I fill my plate with Stirfried Vegetables, Seafood Lasagna, Smoked Duck Breast Confit, Baby Potato with almond/chilli flakes, Thermidor Capsicum, Braised Chicken with Squash and Steamed Fish Fillet. Then we happily tuck in to more festive fare with Roasted Turkey and and a tender Leg of Lamb, accompanied by roasted vegetables, chestnut stuffing and choices of gravy at the side, including mint and cranberry sauce, giblet gravy and black pepper sauce. There are two cooking stations. Just pick your favourite ingredients from the tray filled with sliced beef, chicken, fish and sausages and chef will stirfry them a la minute. Or choose from spaghetti and fettucine for a plate of hot pasta. The festive menu is available for Christmas Eve and New Year’s Eve. 30% off for senior citizens (55 and above).